Your day-by-day itinerary now includes Penguin Parade. 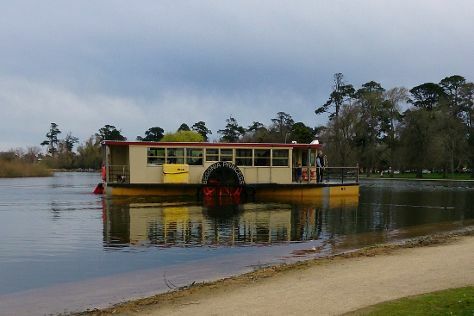 Escape the urban bustle at Lake Wendouree and Melbourne Zoo. Head to Melbourne Central and Collins St/Swanston Stfor some retail therapy. The adventure continues: wander the streets of Degraves Street, take in the spiritual surroundings of St. Patrick's Cathedral, contemplate the long history of Melbourne General Cemetery, and admire the striking features of Former Records Office. To find other places to visit, photos, and more tourist information, read our Melbourne trip itinerary planner. Chicago, USA to Melbourne is an approximately 22.5-hour flight. You can also do a combination of train and flight; or do a combination of bus and flight. Due to the time zone difference, you'll lose 16 hours traveling from Chicago to Melbourne. In April, Melbourne is somewhat warmer than Chicago - with highs of 68°F and lows of 50°F. Finish up your sightseeing early on the 10th (Wed) so you can travel to Sydney. You'll explore the less-touristy side of things at The Rocks Markets and North Head Sanctuary. 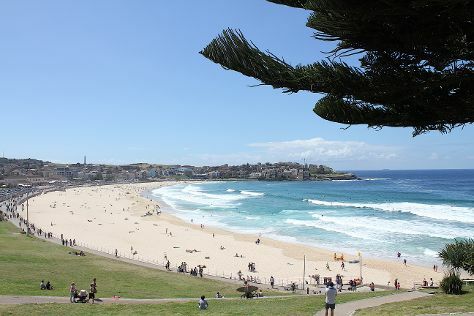 Get outdoors at Bondi Beach and Clovelly Beach. Take a break from Sydney with a short trip to Shelly Beach in Manly, about 36 minutes away. And it doesn't end there: appreciate the extensive heritage of The Rocks, take a stroll through Darling Harbour, trek along The Opera House to the Botanic Gardens Walk, and catch a live performance at Sydney Opera House. To see where to stay, other places to visit, traveler tips, and tourist information, read Sydney road trip planning website . You can fly from Melbourne to Sydney in 3.5 hours. Other options are to do a combination of shuttle and flight; or drive. Plan for somewhat warmer nights when traveling from Melbourne in April since evenings lows in Sydney dip to 59°F. Finish your sightseeing early on the 13th (Sat) so you can travel to Brisbane. Visiting Zipline and The Brisbane River will get you outdoors. Visit Boggo Road Gaol and Albert Street Uniting Church for their historical value. The adventure continues: identify plant and animal life at Lone Pine Koala Sanctuary, ponder the world of politics at General Post Office (GPO), contemplate in the serene atmosphere at Nepalese Pagoda, and make a trip to Cathedral Square. To see more things to do, reviews, maps, and other tourist information, go to the Brisbane trip maker tool . You can fly from Sydney to Brisbane in 4 hours. Alternatively, you can do a combination of flight and bus; or drive. April in Brisbane sees daily highs of 78°F and lows of 61°F at night. Wrap up your sightseeing on the 16th (Tue) early enough to travel to Cairns. Visiting Palm Cove Beach and Atherton Tablelands will get you outdoors. For shopping fun, head to Humpy Nut World or Rusty's Market. Venture out of the city with trips to Curtain Fig National Park (in Yungaburra), Historic Village Herberton (in Herberton) and Birdworld Kuranda (in Kuranda). Spend the 17th (Wed) among aquatic life with a scuba or snorkeling tour. The adventure continues: head off the coast to Michaelmas Cay, explore the world behind art at Cairns Art Gallery, admire the landmark architecture of Freshwater Station, and take in the dramatic scenery at Josephine Falls. For reviews, maps, more things to do, and tourist information, read Cairns trip itinerary maker app . You can fly from Brisbane to Cairns in 5.5 hours. Alternatively, you can do a combination of bus and flight; or drive. Prepare for a bit warmer weather when traveling from Brisbane in April: high temperatures in Cairns hover around 85°F and lows are around 72°F. Cap off your sightseeing on the 22nd (Mon) early enough to travel back home.